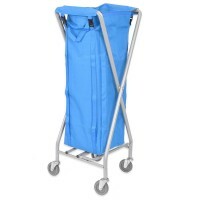 Stainless Steel Commercial Laundry Bag / Carry Sack Trolley - Non-scratch Professional trolley for laundry bags. Suitable for heavy duty use in wet environments. 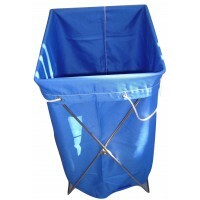 This robust trolley features a full stainless steel construction and a far superior construction to our other range of laundry bag holders which have a plastic frame at the top. For the single bag holder this version even works out cheaper. Suitable for heavy commercial use with non-scratch stainless steel construction. 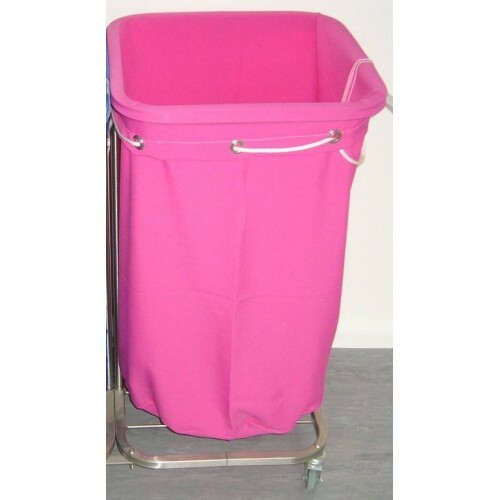 Used by hospitals and commercial laundries. Our heavy duty laundry bags fit on this trolley without the need for a toggle (required by other trolleys to secure the bag to the trolley). The opening of the bag is far greater than the standard trolleys, making it easier to fill. The only down-side is that these trolleys do not have the facility for a lid. 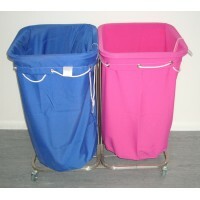 If lidded trolleys are required then please see the alternatives below. Multiple units can be linked together (linking bars supplied separately) to provide a multiple bag holder - please call for details. This system provides far more flexibility in the use of the trolley. 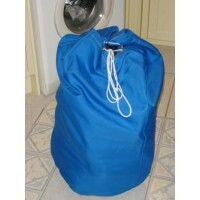 Designed for use with our laundry bags. Please note that the bags shown are not supplied with the trolley. Robust construction stainless steel frame. Being stainless steel this trolley does not scratch / damage and is even suitable for front of house areas as it does not scratch. 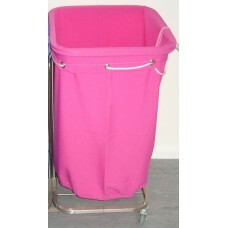 This is a high quality trolley suitable for professional laundry use. Supplied in flat-pack form for ease of transport and easily constructed using tools included. 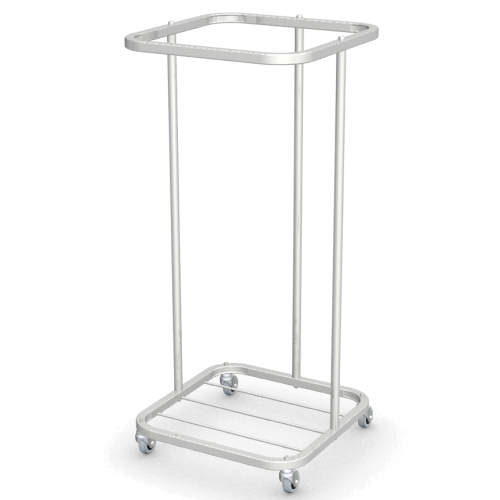 We stock approximately 50 trolleys at a time, with larger quantities available within a couple of weeks. Note that this is lower than many other bag holders in order to fit under worktop counters.